I've been ready to try this beer since I had an Anchor Christmas for the first time, back in April, which the was brewery's 2014 offering. I gave last year's Christmas Ale an 8.0/10. If you think back to that post (or you click the hyperlink in the middle of this post's first sentence), you'll recall (or discover) that the brewery changes up its recipe each year. There is a single thing I know about this brew right off the bat (before I break into my bottle): it's a traditional, spicy Christmas brew. As much as I've thoroughly enjoyed the last two beers I've sampled for the blog, it'll be nice to get back to a classic Christmas ale, especially with the big day right around the corner. 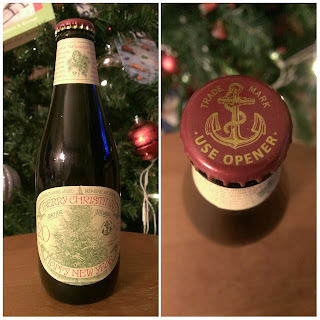 In my first Anchor Christmas Ale post, I gave a rundown of the brewery's history. They've had a fairly turbulent century and a half--they're probably one of the oldest brewery's I've discussed on the blog--but, luckily for us, they've managed to weather the years (seriously, they've dealt with prohibition, an earthquake, and untimely deaths). If you'd like to read up on Anchor's full history for yourself, head on over to their "Our History" page for all the specifics. Due to the changing nature of Christmas Ale's recipe, it's official page is pretty mum on its ingredients. It does provide us with some pretty interesting info (although it's unrelated to the brew itself): 2015 is the 41st year of the ale (and, by extension, the 41st iteration of its recipe) and the tree featured on this year's label is a Deodar Cedar (the page gives a brief history on the tree). The bottle 2015 Christmas Ale I've managed to snag tells me one more bit of information: the ale has an ABV of 5.5%. That ABV is the only specific I know about the brew, however. So, without further ado, let's see what this year's ale has up its sleeve! What's up its sleeve doesn't appeal to Purrl in the least. She gave it zero whiffs. 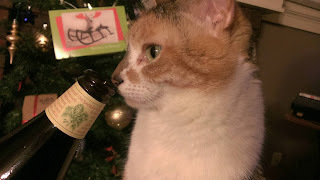 I can't tell why--I think 2015 Christmas Ale smells delicious. First and foremost is a wave of molasses. After that, I find a few chocolaty notes that round out the aroma. After taking my initial swig, I find myself significantly less impressed with flavor than I assumed I would be. It has that traditional spiciness I expected, but it's subdued, washed out with an inexplicable piney flavor. It's not bad, but it took me a moment to get used to it. It's a robust flavor that lingers in my mouth after each swig. There's a sweetness on my lips that is otherwise absent in the brew's flavor. This is a chewy ale. As soon as the beer meets my mouth, it explodes into a rush of foamy carbonation. This is something else that I hadn't expected from the brew. It adds a further touch of uniqueness to this year's offering. One year for winter break my parents surprised my brother and me with a trip to Colorado to go snowboarding. I, of course, hadn't been snowboarding in years and, although I managed to remember how to do it by the time we left, the majority of that part of the trip was lost on me. However, one day we took a break from snowboarding to drive around in snowmobiles. This was something I'd never done before, and it was a blast. We were in, what seemed like (although there's no way it was, in truth) an uncharted, snow-covered wilderness. We were literally in the middle of nowhere. The snow was up to my waist and it still continued to fall. You know that Christmas song about a winter wonderland? That's pretty much what that snowmobiling escapade was like. That's snowboarding excursion is the memory brought upon by this year's Anchor Christmas Ale. When compared to last year's Christmas Ale, Anchor Brewing's 2015 Christmas Ale is vastly different. It's not as sweet nor is its spiciness as apparent. Despite these differences, the brewery's Christmas Ale nets an 8.0/10 for the second time in a row. As it stands, it's better than a lot of Christmas brews I've tried and I can't wait to see the ale 2016 will bring.